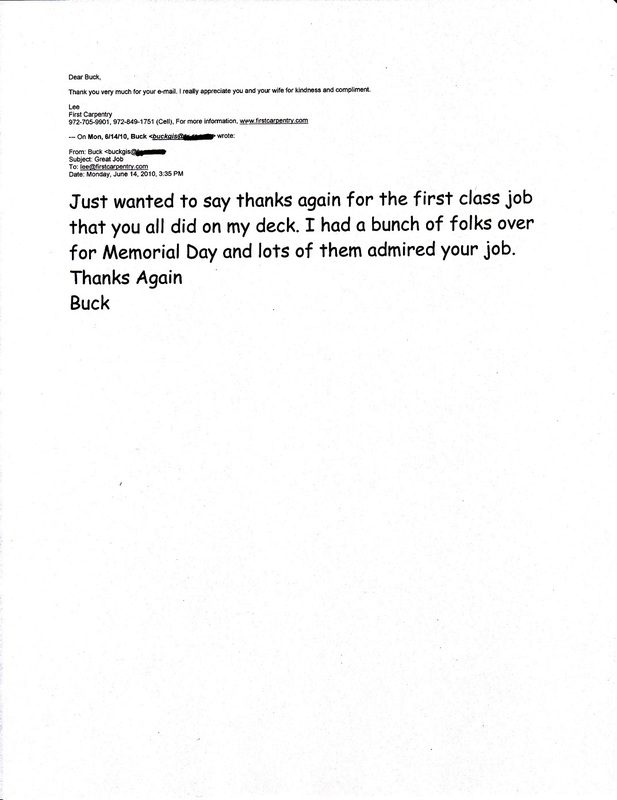 Thank you very much for your visiting at firstcarpentry.com. If you have any questions for your project, please send me e-mail with some brief information (type of work, rough dimensions, specifications, etc.) and some pictures for your project as well as your name & area of your house. My working area is limited depending on the distance. I can answer most of questions including a rough estimate by mail. Your mail will be answered in the night time on the same day after work in most of cases. During day time, I am at the job site. If you need to talk to me, please call my cell at 972-849-1751. To send me mail, please copy & paste my email address, lee@firstcarpentry.com and use your own email. My name is M. H. Lee (I am a Korean). 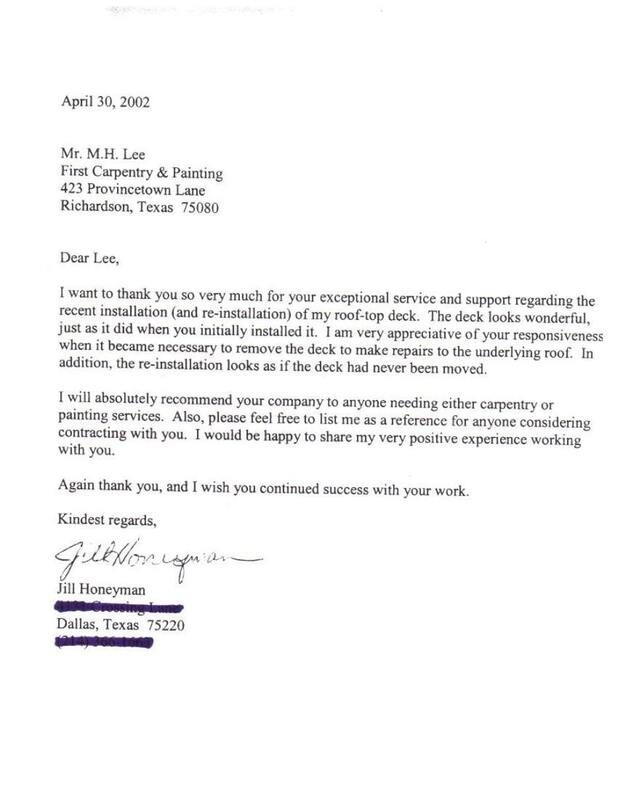 Please call me Lee. 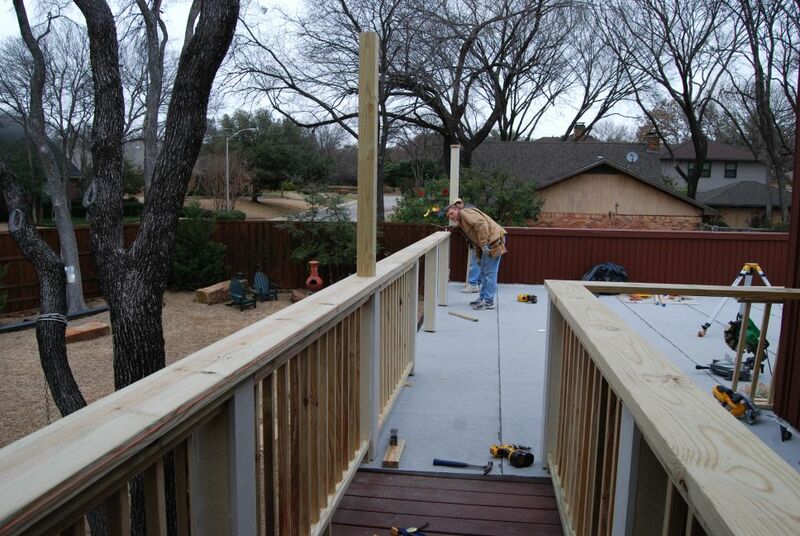 Since 1986, I have been working as a professional carpenter in Dallas, TX area. Terms of Payment: I don't ask any down payment for small jobs. They will be upon completion. For larges jobs which need to purchase lots of material, they will be as agreed per cases. Recently, I am receiving a lot of inquiries for built in bookshelf. It is very time consuming job and expensive even though it is very simple design. It costs about $500 to 1000 up per linear foot per your spec. There is some more articles below about built ins. For example, 8' long x 8'H would cost about $4,000 & up for a simple open bookshelf. The Jos I Do: Most of Carpentry & Painting, Home Repairs & Remodeling, Interior & Exterior Trim, Finish Carpentry, Wainscot, Windows, Doors, Decks, Siding, Railing, Built-in Cabinetry, Tile, Kitchen & Bath Remodeling/Repair, etc. I will show up on time as promised unless I inform you in advance. I will not skip any working days until I finish your project without prior notice. I will follow all basic procedure with my best knowledge and manufacturer's instructions. I use top quality material, straight lumber, quality paint, caulk (35 years), etc., unless otherwise stated. If you don't have a specific idea for your project, I will perform with my best knowledge. Please understand that repair/remodeling cost more than new construction. I usually work from 8 am to 6 pm. In case 1 or 2 days job, if I am allowed to extend hours, I would like to work until I finish the job instead coming back on next day. I try to work more hours to shorten the number of working days. Construction is very messy and bothers all of your family. I will protect your property from dust and scratches on floor as much as possible. I will keep job site as clean as possible. I am very well equipped with quality tools. I am a professional carpenter with common sense. If you are not satisfied with my personality and/or job performance, please let me know. I will correct it immediately. I used to be a mechanical engineer for Dong-Ah Engineering & Construction in Seoul, Korea. Dong-Ah is one of world leading construction companies, which has built US $8 billion in the middle east. Terms of Payment: No down payment for small jobs (upon completion) or as agreed for large jobs per cases. I don't take any inside pictures of occupied homes for protection of my clients. So most of pictures in this website are exterior, but I do lots of interior remodeling & repairs (50% interior & 50% exterior). Note: Please feel free to contact me without any obligations. 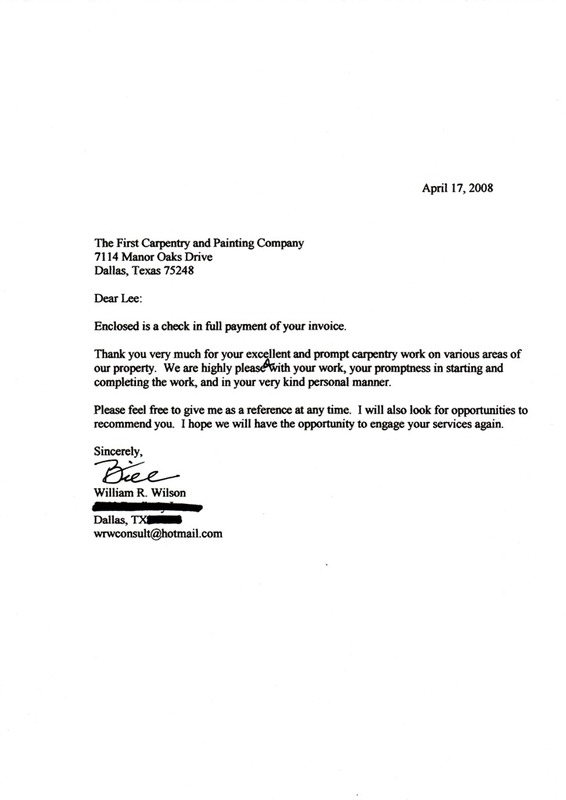 After I send you an estimate by email, I don't contact you until you reply. This website does not contain any harmful virus and spywares and it's ISP is Yahoo Small Business Web Host. If your project is kind of urgent, please call me to check my schedule. Sometimes are very busy, sometimes no job. Same day service is available if I don't have any schedule. I do most of estimates on Saturdays or after work (late afternoon) during weekdays. Please feel free to contact me on weekends or evening time. 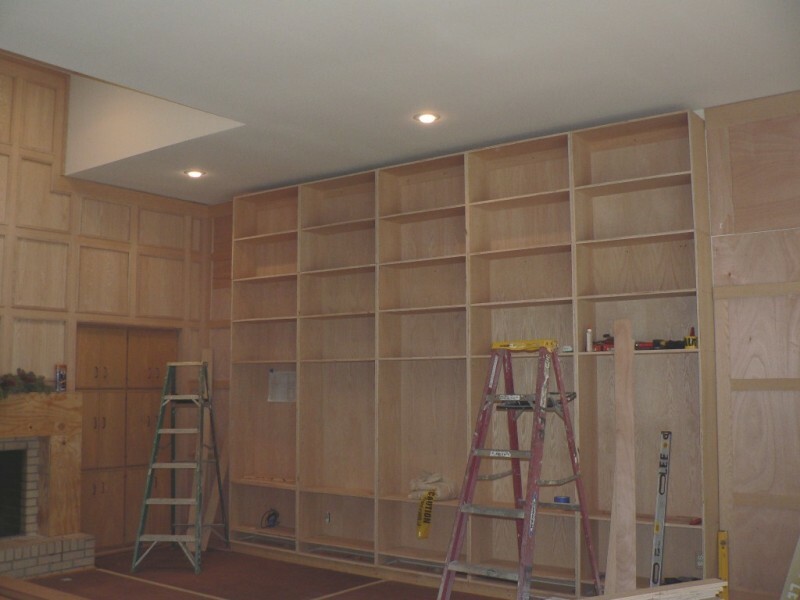 About Custom Built-ins: Recently, I have been receiving many inquiries about custom built ins for bookshelf, TV entertainment center, etc. Please read followings about custom built-ins. 1. Any customs built ins are very time consuming job regardless of the sizes. It means very expensive. For example, bookshelf, size 8'L x 12"D x 8'H, all open shelves, very simple design, the cost of carpentry only, unfinished, would be more than $2,500 including installation and it will take 3 to 4 days. The cost of finish for stain or painting would be another min. $1,500. It will take another 2 to 3 days (sanding, prime or stain, painting or polyurethane clear finish coats/2 times). 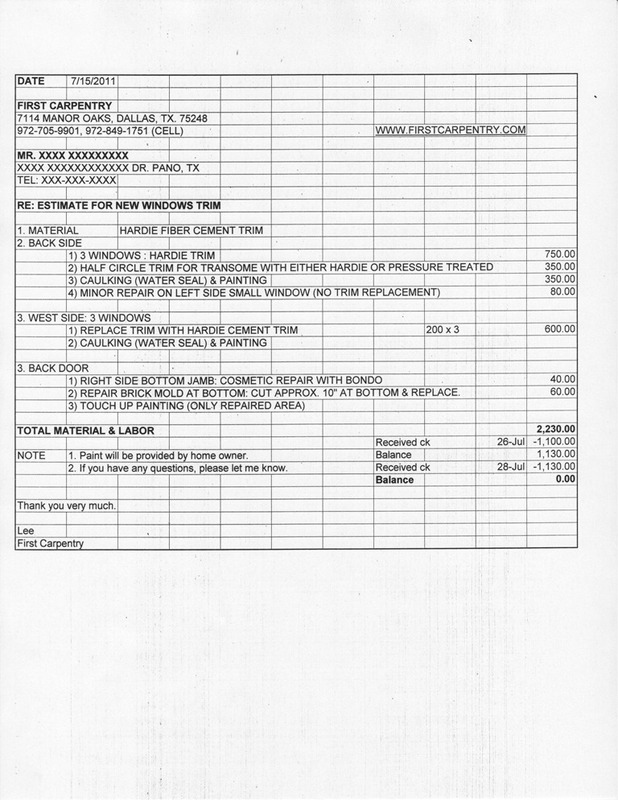 So total material & labor (carpentry & finish) would cost more than $4,000. It is about $500 per lf. If you add doors, drawers, decorative design, etc., it will add to more of the cost. 2. Built -in is only one piece for your home, not mass production. 3. Most of pre-made ones in furniture stores are less than the cost of material, and good quality. 4. Advantage of custom built-in is for certain size. It fits into your space between wall & wall and floor to celling per your specifications. 5. It should be much better to buy pre-made ones instead of custom ones if you can use. 6. If you need custom built-ins, please let me know with some information (size, stain or painting, rough specifications and some pictures of space). I can give you a ball park estimate by the mails. 7. I am a mobile carpenter. I set up all carpentry tools and build everything at the job sites. So you will see all procedures and progress. If you want to change the design or something else, it is very easy and convenience. Before starting, I protect your floors and other stuffs and maintain job site clean as much as possible. 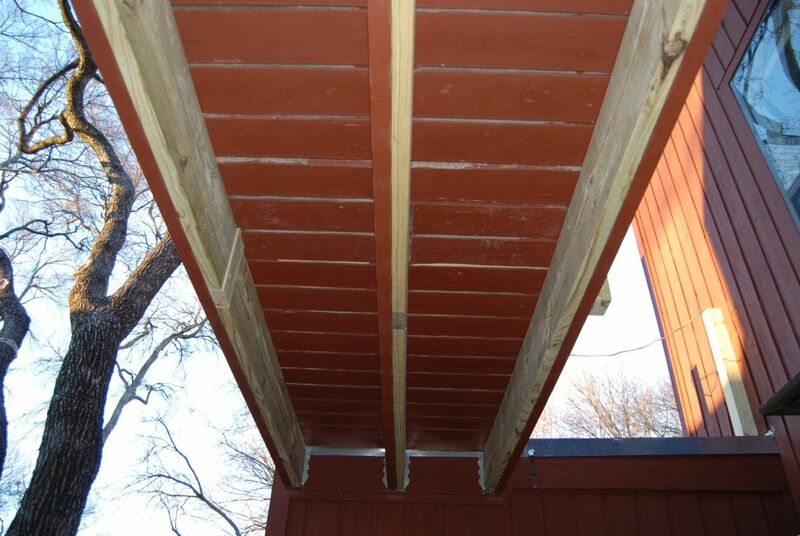 Scope of works: Repair/replace all rotten fascia & soffit, protection, sanding, clean, caulking, spot prime on bare wood & painting. Kitchen cabinet paining: Sanding entire surface, replace all hinges. This Job took about 4 weeks (1 week for kitchen cabinet painting and 3 weeks for exterior carpentry repair and painting). All trim & bottom sills are rotten by sprinkler water. Replaced all trim (brick mold) with PVC, sill with pressure treated lumber, and radius top trim with polymer molding. Radius trim (flexible molding) is special order made. It is made per order (radius & length) and takes about 2 weeks. So it is very expensive, @12.00 per ft (about $96 for 8' long). 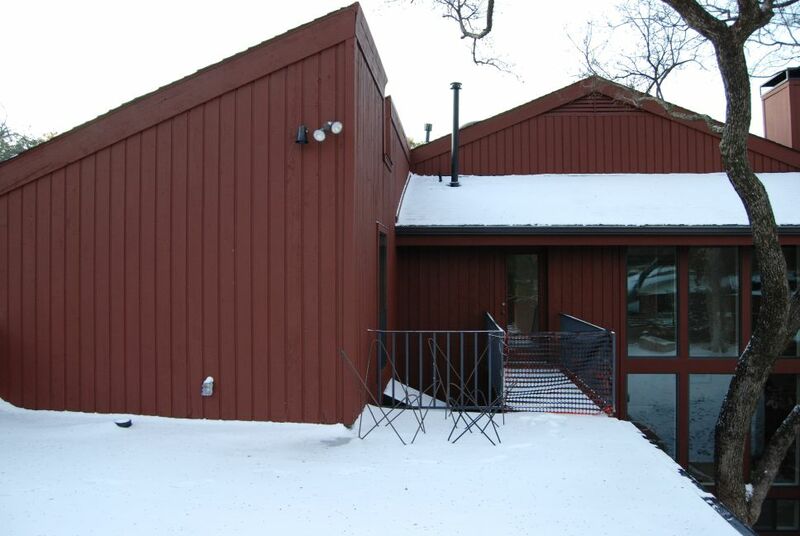 Scope of works: Replace whole front (in & out), 8'w x 26'h, siding, drywall, framing, door & finish in & out. The weight of new front door is about 520lbs, special order made, walnut, 4"w x 96"h x 2-1/4"T and 1 side, factory pre-finished (standard front door: 36'w x 80"h x 1-3/4"t). 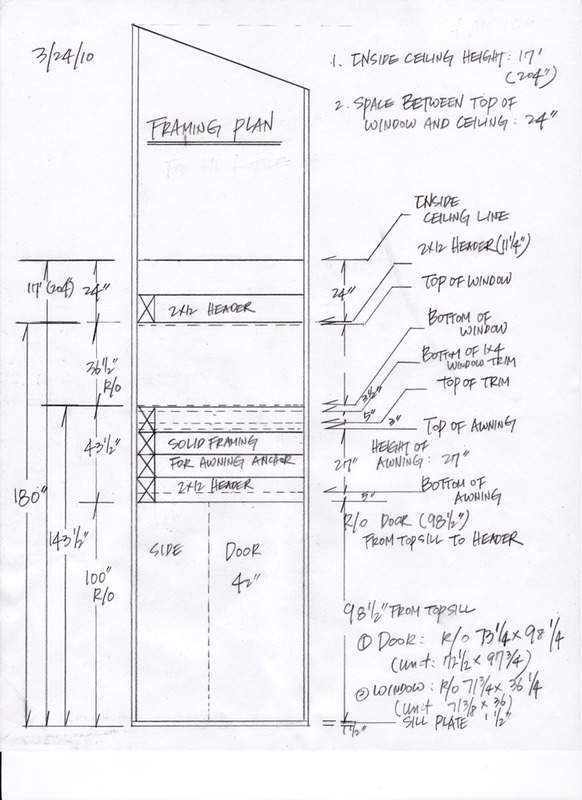 In order to install a very heavy, tall & wide door, first I had to build very strong framing. All 2x6 studs & 2x12 header were fastened all together with 5" lag screws (3 studs at each side), and plumbed & leveled almost perfectly. This kind of job should be done in one time because adjustment or fine tuning of heavy door is very difficult. In general, most of painting grade or unfinished doors are fairly easy to be installed because we don't need to worry about scratches too much during installation. We (3 carpenters) could not wear tool belt and wrapped our pants belt with thick rag to prevent from scratches. If the surface is once scratched accidently, it is almost impossible to fix unless whole door is re-finished. This door jamb also is pre-finished with stain. So, to secure the jamb into house frame, 4 of 1/2"dia x 5/16" deep holes on each side jamb were to be made to place 3" screws because there are no invisible spots to secure the jamb in the frame. These holes will be plugged with same walnut. A door set was delivered at the job site on 4/09 morning at 8:30 and installation was completed successfully around 5 pm. Built solid framing above door (3'H) for anchoring the large and heavy metal awning (11'x5'). So awning guys can use any surface to secure the heavy awning. From Monday (4/12/2010), siding, trim and painting will start. Cost of this job is about $9500 without door set. Job started on 2/15/2010 (Monday), scheduled finish will be around 2/27/2010 (2 weeks). 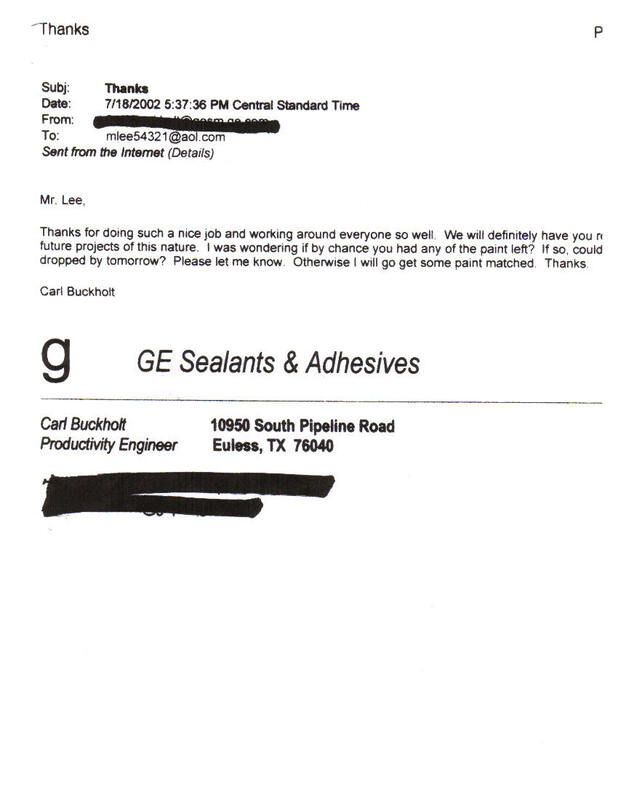 This job was finished as scheduled on 2/26/10. Sometime in April, I will paint it, and then I will place some more pictures. 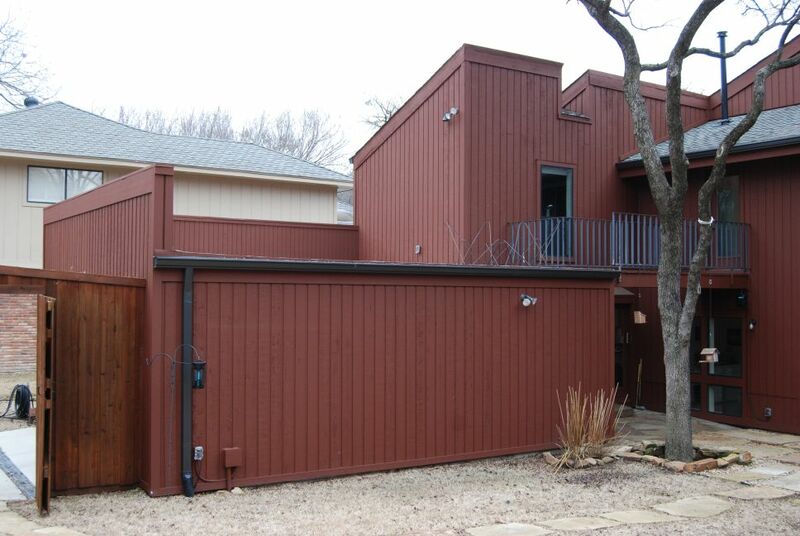 Basic concept: Matching with the house cedar siding, rustic looking and painting same as house color, not much fancy. Strong posts as much as possible from the given situation, half lap joint with glue & screws instead of miter joint for strong joint between boards. All posts were bolted into the house framing ledger board (2x12) inside garage with construction adhesive, not on the roof decking. Material: Posts, 4x4 pressure treated lumber and Hardie cement board for wrapping. On 4/16/10, all painting was done. I am doing this job with one of the best carpenters (Phillips) from England. He is a fine furniture wood working carpenter with associate carpentry degree from England. He has very good common senses and personality. Now he is working for me, but sooner or later, he will be a carpentry contractor in Dallas area like me. It was 2 days job. Replace with Hardie cement siding & trim board. Painting (Home owner provided paint.). Total material & labor: $1,280. Please click to see large pictures. 12. I did only carpentry & painting (approx. $35,000). 1. Day 1(Mon): Set up dust barrier and protect floor & others as much as possible. Remove sheetrock and framing. 2. Day 2(Tue): Build new headers and framing. Cut the brick larger than the window size. 3. Day 3(Wed): Install 2 windows (64"x69", white aluminum frame, tempered & double insulated glass, low-e), and sheetrocking. 4. Day 4(Thu): Brick repair, install brick metal lintel, and sheetrock texture. 6. It took 5 days (7:30 to 6:30 everyday) with 4 crew members and cost about $7,000(material & labor). Following pictures are built-in bookshelf that I recently built in Plano (09/12). The size is 6'w x 8'h x 20"d. Material is oak plywood for main body and shelves, 3/4" solid oak for all face frame and 1/2" oak plywood for backing. It took 6 days (3.5 days for carpentry and 2.5 days for stain & clear polyurethane coat (2 coats). All shelves are adjustable except middle one. Joining methods are dado, rabbit & pocket screws with wood glue. This is very typical way of quality carpentry joinery, nothing special. All of carpenters use this method. One of critical problems during the job in the occupied homes is dust during the sanding job. Before starting a job, sealed everywhere with plastic, then attached a sander with heavy duty DeWalt automatic vacuum to minimize dust. Protective clear coat was lacquer on all shelves (3 coats) and all face frame and main body was wipe-on polyurethane (2 coats). It costs $4200 for material & labor ($2700 for carpentry & $1500 for stain & finish coat). Pictures don't show all details because of small space. It took about 3 weeks. I don't take any inside pictures, but home owner gave me a permission to take pictures for my website. I really appreciate home owner for their kindness and jobs. Home owner wanted to build a built-in at the corner of kitchen to accommodate a built-in type Sub-Zero refrigerator & wine cooler. They tried to buy the pre-made cabinets, but they couldn't find right sizes and matching doors. Two wall corners were extended and built base & wall cabinets as well as doors. I duplicated them almost same as the others. It took 2 weeks (2 days for demo & wall repair, 6 days for carpentry & 3 days for painting & tile for back splash). It cost $9,000 for labor & material. Tile was supplied by home owner. Half circle trim was made with 2 layers of 5/16"t, Hardie cement sheet. Water seal around all trim (heavy, but nice bead of caulking with Sherwin Williams A950, 55years) and painting. 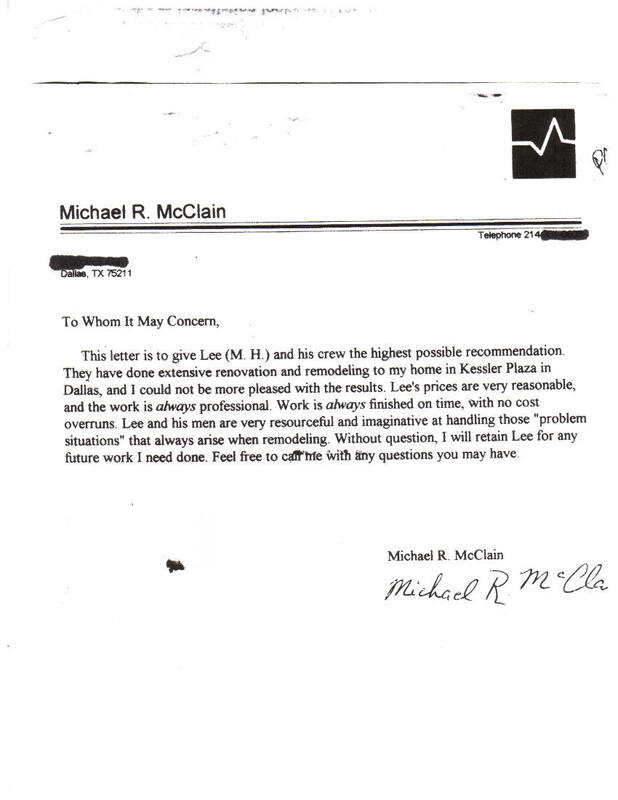 Total cost for material & labor was $2,230. Painting: Repaired areas only (touch up) and paint was provided by home owner. Even touch up paint is same as original left over from the previous painting job (2 years ago). At the edge of siding and trim, there is very little color difference showing because of color fading and dirt on the siding. It will take some time to be the same. Any touch up painting: We need to understand very little color variations between old and new painting due to aging even though it is same paint. All of damages had been caused by water penetration and aging. This kind of job requires a lot of carpentry tools. It was empty master closet. It was helping a friend of mine, who is a contractor for this project. This is same procedure & material for any built-ins, bookshelf, etc. Any type of built-ins are very expensive because of time consuming labor. The prices of furniture and cabinets at stores are mostly less than the cost of material. They are mass production, but built-in is only one piece building. So you would better buy if there is something you can use instead of custom built. But if you have to have custom built, please let me know. If you send me couple of pictures showing the space where built-in will be set and some brief information, size, basic design concept, rough specifications and type of finish (painting or stain) that you want, I can give you rough estimates by the email. If the estimate is within your budget, I can visit your house and discuss further details with you. As I am a mobile carpenter, I set up all carpentry tools at the job site, and then I build everything. So you can see all progress, workmanship and material. You can change something during the job as you want. I keep job site clean as much as possible. Job is being delayed because more damage in framing was found. It should be completed by 3/07/2008. This job (carpentry only) was completed on 3/08/08. Old siding (composite material), sheathing & framing was damaged by water & termite.